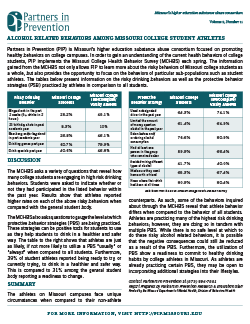 Alcohol use among college students is often seen as a “rite of passage” and most Missouri college students (75%) have consumed alcohol in the past year*. 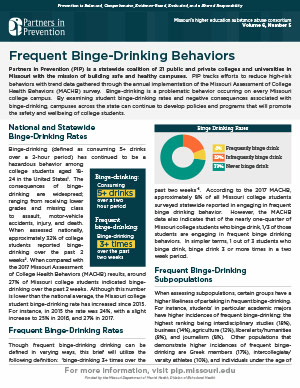 Binge Drinking: Binge drinking is a pattern of alcohol consumption that brings the blood alcohol concentration (BAC) to .08% or more. This corresponds to 5+ drinks on a single occasion/in 2 hours for men, and 4+ drinks for women on a single occasion/in 2 hours. Binge drinking is associated with health problems and other issues including unintentional injury, violence including homicide, suicide, intimate partner violence and sexual assault, memory and learning problems, and alcohol dependence. Heavy Episodic Drinking: For men, heavy drinking is defined as 15 or more drinks per week and for women, 8 or more drinks per week. It can also be defined as 5 or more binge drinking days per month. Heavy drinking can increase the risk of reproductive health issues and sexual function issues, certain kinds of cancer (especially mouth, throat, and liver cancers), heart disease, and more. 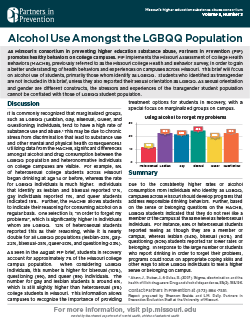 Underage Drinking: Studies have shown that alcohol use by adolescents and young adults increases the risk of injury, alcohol dependency, risky sexual behavior, and poor performance in school. Brain development continues well into adulthood (around age 25) and repeated alcohol use may lead to impairment of brain function. 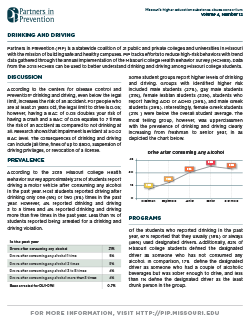 Drinking and Driving: Alcohol use slows reaction time, impairs judgment, and causes loss of coordination. 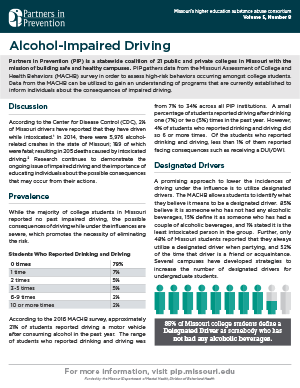 It is never safe to drive after consuming any alcohol. Alcohol and Medications: Mixing alcohol and medicines can be harmful, even over the counter medicines. Drinking alcohol can intensify the effects of the medicine and individuals may experience negative side effects. The most common are drowsiness, dizziness, changes in heartbeat and blood pressure, liver/stomach damage, and increased risk for overdose. Always read medication labels and avoid drinking alcohol after consuming any medications. 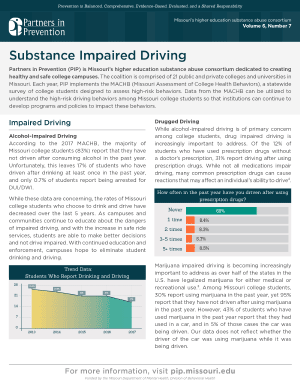 Alcohol and Illicit Drugs: Combining alcohol and any illegal substance can be dangerous, and you cannot be 100% sure of what you are taking. Combining alcohol (a depressant) with a stimulant (such as cocaine) puts your central nervous system, respiratory system, and cardiovascular systems under pressure and can cause organ damage. Combining alcohol with another depressant (such as Xanax) and the effects can multiply, severely depressing your central nervous system and putting you at risk for overdose or death. Alcohol Use Disorder (AUD) is problem drinking that becomes severe enough to be given a medical diagnosis. AUD is a chronic relapsing brain disease characterized by compulsive alcohol use, loss of control over alcohol intake and a negative emotional state when not using (NIH, 2017). 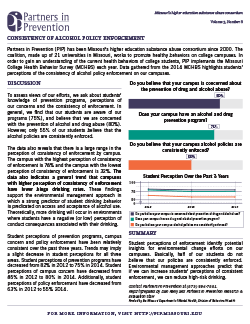 Actively enforce alcohol laws and policies for MIP, MIPS, open container, public intoxication, etc. Social norms are “the customary rules that govern behavior in groups and societies” (Stanford Encyclopedia of Philosophy). 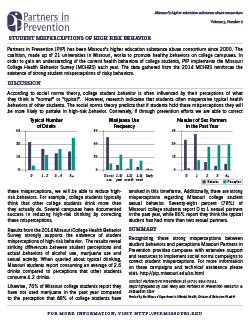 The social norms approach works to correct misperceptions that people hold about behaviors. People tend to over-estimate negative behaviors and under-estimate positive behaviors, and social norms help to positively influence behavior by message framing and providing accurate information about people’s choices. Check out the National Social Norms Center for more information on social norms. 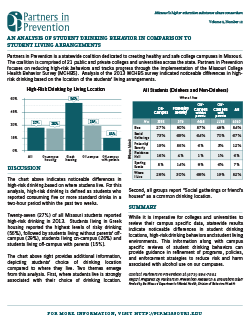 A comprehensive approach is needed to address high risk drinking behaviors among college students. 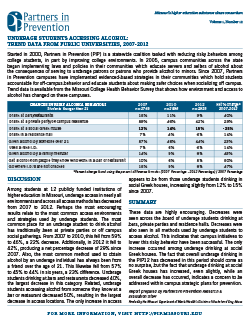 Prevention efforts should focus not just on individual and group level intervention, but also to the community and institution level. Developing a strategy, overseeing implementation, and evaluating a comprehensive approach is vital to enact change, and will require hard work and dedication. 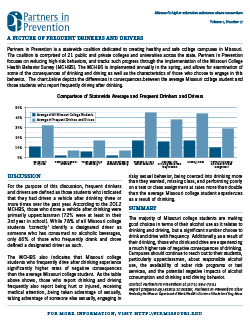 Bars, restaurants and nightclubs participating in CHEERS provide FREE non-alcoholic beverages to the acknowledged designated driver in a group of two or more. Click here to learn more about CHEERS! 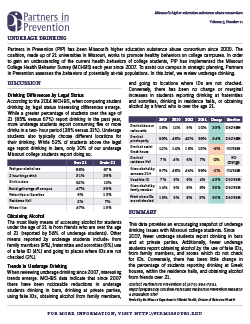 The State of Missouri Alcohol Responsibility Training (SMART) program is an interactive, web-based course available free of charge to those who own or work for any Missouri establishment licensed to sell alcohol. Click here to learn more about SMART! 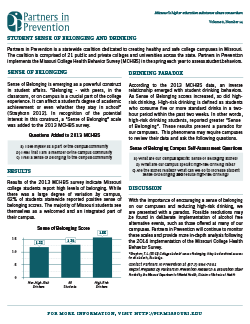 The Student Alcohol Responsibility Training (START) program assists students in planning and hosting a successful, fun, and safe event of any kind. Click here to learn more about START! 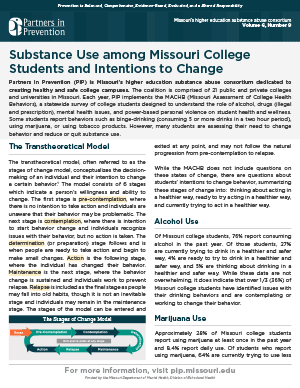 MACRO, the Missouri Alliance of Collegiate Recovery Organizations, is a statewide initiative to support addiction recovery efforts on college campuses. 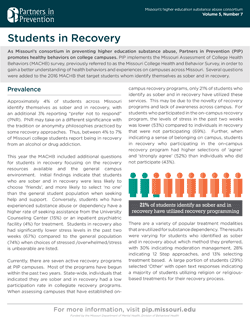 With support from the Missouri Department of Mental Health, MACRO provides resources, networking opportunities, and financial support for schools as they start and grow their own recovery support services. Click here to learn more about MACRO! Harmful Interactions – Mixing Alcohol with Medicines. 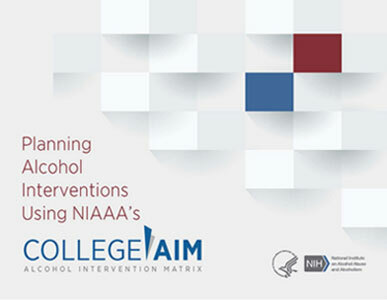 National Institute on Alcohol Abuse and Alcoholism. 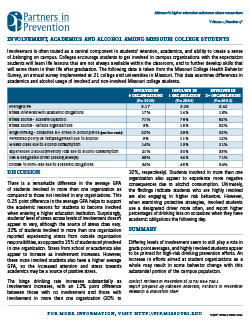 How to Reduce High-Risk College Drinking: Use Proven Strategies, Fill Research Gaps. White & Hingson. (2014). The Burden of Alcohol Use. 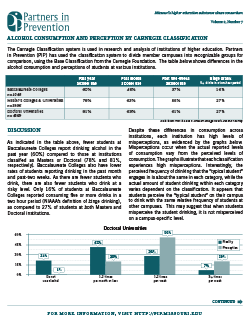 Alcohol Research and Current Reviews. 35(2): 201–218. Scott-Sheldon, L. A. J., Carey, K. B., Elliott, J. C., Garey, L., & Carey, M. P. (2014). 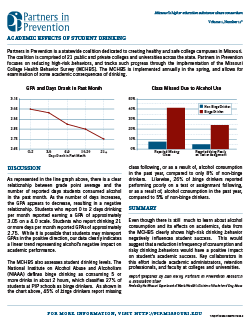 Efficacy of alcohol interventions for first-year college students: A meta-analytic review of randomized controlled trials. Journal of Consulting and Clinical Psychology, 82(2), 177-188. Witkiewitz, K., Desai, S. A., Bowen, S., Leigh, B. C., Kirouac, M., & Larimer, M. E. (2014). 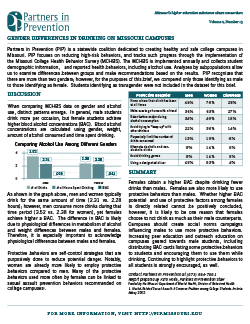 Development and evaluation of a mobile intervention for heavy drinking and smoking among college students. Psychology of Addictive Behaviors, 28(3), 639-650.